In Charles Bank Gallery, Vahap Avşar’s work troubles the viewer, just the right amount. The summation of the four different bodies of work is charged with politics, in particular of New York, while the mixture of aesthetics—found imagery, painting, installation and video—exposes the artist’s struggle with different media to best represent his concerns. The exhibition feels like a studio visit, rather than a narration, which revitalizes Avşar’s work. Vahap Avşar, “Ipdal 2,” 2010. Digital C-Print. For Ipdal (2010) Avşar used some of the postcards that he rescued from a printer’s collection in İstanbul. 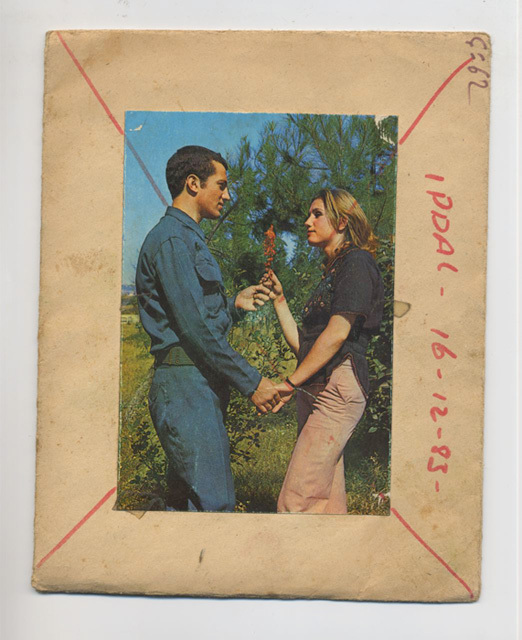 From over 20,000 postcards made between the late 1960s and 1990s, Avşar chose to enlarge and exhibit those which were marked by the word “ipdal,” meaning cancelled. The artist explains, on his website, that this particular form of censorship was executed by the military government in the 1980s, which wanted to eradicate anything that did not fit its narrative of Turkey. Included in these “cancelled” images are soldiers in romantic poses with women. The innocuous nature of the imagery becomes particularly disturbing with the red crosses scarring the couples, obviously posed for the camera. The artist’s decision to enlarge these postcards reads as both a formal and political gesture; the street-level gallery space becomes a public shaming of the Turkish government of the time as the large photographic prints are clearly visible to the public on the street. In the context of the current Turkish government’s not-so-swift censoring of books and websites, including YouTube, there is a tongue-in-cheek criticality, almost to say, the reality of yesterday has become also the reality of today. Vahap Avşar, “I.E.D.,” 2010.Oil on canvas, 48 x 60 inches. Ipdal is juxtaposed with two canvases, also from 2010. I.E.D. and W.T.C. 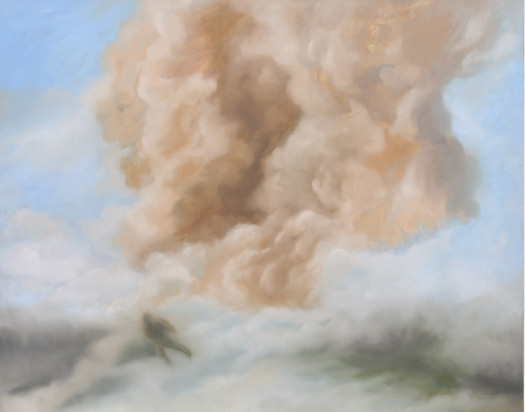 are Courbet-like depictions of a man falling through a sky of light orange cloud and a vaguely discernible tower crumbling, crushed by a dense cloud of smoke. Both paintings are quite abstract and the artist uses subdued colors, as if he were seeking a moment of solace or contemplation in the middle of disaster. NONEISAFE (2008) is the loose link in the show as it is too spectacular. 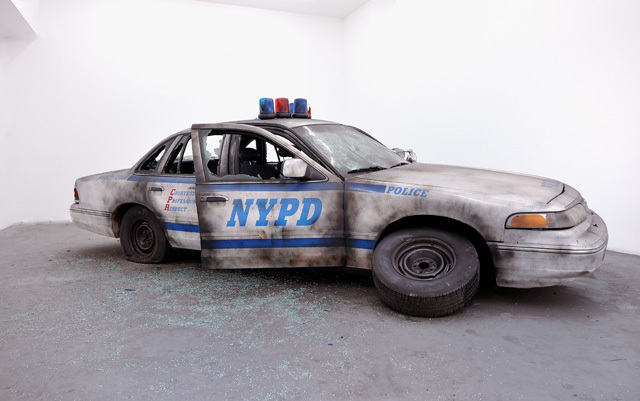 The destroyed police car that sits in the middle of the gallery is shocking, in a momentary, amusement park-like way. The saving grace of the installation is that the car was smashed inside the gallery, leaving shards of glass everywhere and the “realness” of the violence takes the edge off the blockbuster make-believe. Vahap Avşar, “NONEISAFE,” 2008. 1996 Ford Crown Victoria Police Interceptor (P72), debris. Dimensions variable. The tour-de-force of the exhibition is Tekmil (2010). In the subtitled video, a soldier ritualistically answers questions from an unseen person. 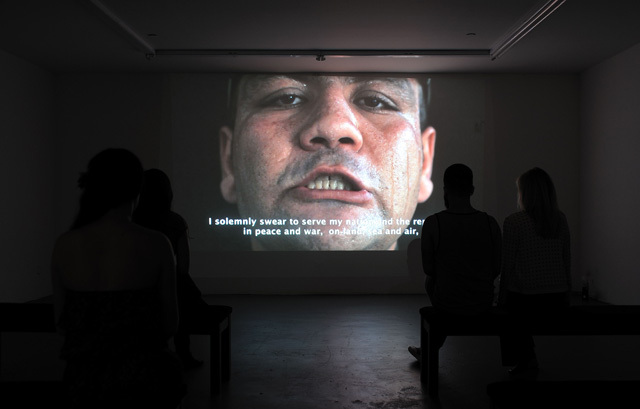 The black background and the central position of the soldier create an ominous atmosphere in the downstairs video screening room, exponentially raising the tension already built by the two-dimensional works upstairs. The close-ups of the soldier’s face reveal beads of sweat, humanizing the military, which is rarely done in the context of a developing country with a strong military culture like Turkey. Even as a native-Turkish speaker, like myself, the soldier’s words are extremely hard to follow, highlighting the futility of such exercises. The invisible man asks, “Do you smoke?” and when he gets an affirmative response, casually tells the soldier to “quit that dirty habit.” The humanness of this comment becomes sinister in the context of this power dynamic. The hypnotizing back and forth becomes a background noise after only a few minutes, drawing the viewer into the state of mind of the (a) soldier. In the context of the recent national elections in Turkey, Avşar’s work dangerously has the potential to be read unilaterally. I would argue that it is the shifting idiosyncrasies that mark Avşar’s work with a poignant savoir-faire. It is the precise imprecision of the exhibition that make it all the more obvious that the artist is moved by personal reasons and not with a larger political agenda and the sheer honesty of the lack of a statement is quite lovely. Installation view at Charles Bank Gallery. Posted in content, on artists and tagged Charles Bank Gallery, Merve Ünsal, New York, Vahap Avşar. Bookmark the permalink.